The Wave Dancer. Get that free demo, yo. After a while, you might get tired of free boats and want something a bit nicer. If you have the Lindens to spend, take a look at the AnacondaS Wave Dancer. It’s amazing how spacious the Wave Dancer is inside. You won’t need to adjust your camera unless you prefer driving in mouselook or third-person. It also comes with a full working kitchen, bathroom/shower, cabin/bed, and dining area. There’s a media player just behind the driver’s seat for if you want to play videos while you’re out boating. The dashboard holds a fuel gage, working GPS system, and radar. Even the microwave works, which I found to be charming. You can seat 14 people on it–great for parties or running a tour around the Blake Sea or other body of SL water. The boat turns a little too fast for my tastes in the water, but that’s because it’s meant for driving primarily in mouselook. 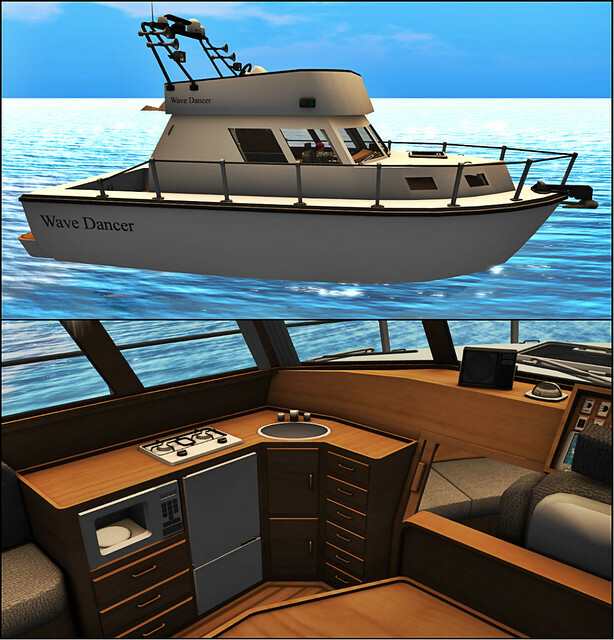 If you’re using an Oculus with this boat, however, you’re in for a pretty great time. The drawbacks of it are small but ultimately decided why I didn’t buy it yet. For everything the Wave Dancer has, the one thing it doesn’t is a multi-sit system. For 2900L, this is something I’m hoping the builder will fix. You see, when you’re out boating, you need to be able to move around your boat without standing up. If your boat doesn’t have a system where you can click and choose various poses on the craft, you’re going to inevitably have to stand up–which might cause your boat to be returned while you’re in the middle of the sea. Multi-seating systems solve this problem while letting you “live” on your boat. Some boats like the A-T Portal Tug even have a roaming system that lets you walk around the boat without ever getting out of your seat. I’ve sent a request to the Wave Dancer’s builder to see if they’re interested in implementing a multi-seating system. If they do it, I’m snatching up this boat as soon as I can. I still highly recommend you trying out the Wave Dancer, though. The demo will let you drive the boat for up to two hours. It only counts the minutes the boat is actually in the water! It’s great for letting boaters decide if they’d like to purchase it or not. If you know of a boat I should check out, contact me in-grid (Aemeth Lysette). For more destinations, check out the SL Sailing directory. See you on the water!